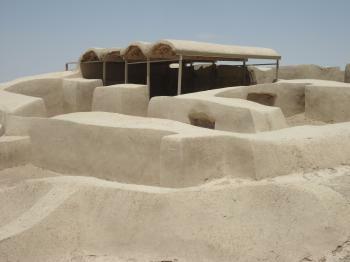 Shahr-i Sokhta ("Burnt City") is an archaeological site of a Bronze Age urban settlement. It is associated with the Jiroft culture, an "independent Bronze Age civilization with its own architecture and language", intermediate between Elam to the west and the Indus Valley Civilization to the east. 'There lies madness when chasing WHS' – wrote Solivagant about the idea of going from Kaluts to Shahr-i Sokhta through all Lut Desert. These words resonated with me as we decided to take this trip. It is 'only' 450 kilometers away and my GPS showed it could take around 6 hours. In fact it took a lot less – maybe 4 hours or so – I drove up to 150kmph through abandoned desert, on a good road, seeing other cars maybe once per 15 minutes. Remember to have enough gas, although there were some gas stations on the way. The landscapes on the way were just great and far different from nebkas near Shahdad and Kaluts. This road is the best way to enjoy Lut Desert and discover its marvels. So as a result it was not that mad to go to Shahr-i Sokhta (believe me, there is much more madness in going to isolated Gonbad-e Qabus from Tehran). We were there at around 3 pm and the staff looked like we were the only foreign tourists this month (they certainly do not see many European families with two small children in Baluchistan and Sistan, the remotest Iranian province)... They let us go without any entrance fee, but the guard accompanied us all the time we visited this site. And the site is very huge, if you want to walk all the paths, reserve at least two hours, maybe even more (we did quicker route which took us almost two hours, but 3-year-old legs are not that fast). Remember to take plenty of water as there is no shadow at all (and the temperature in the afternoon was around 30 degrees – we are talking about the end of October!). The site itself is quite well known, especially among archeologists. 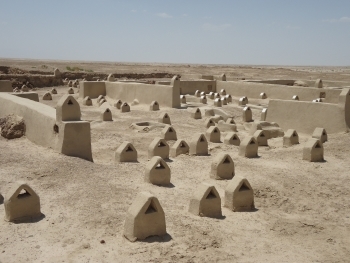 This is one of not so many sites in Iran that is not connected with the culture of Mesopotamia, but with Helmand culture, present mostly in Afghanistan (which is, by the way, less than fifty kilometers away). 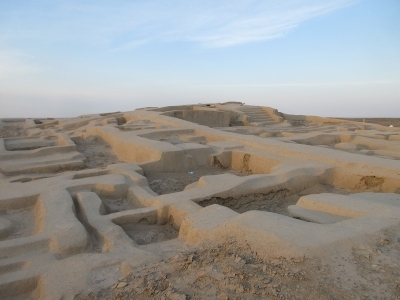 The city was inhabited between 4th and 3rd millenium BC and totally deserted a thousand years later. Now the total area is 150 hectares, out of which 25 hectares is cemetery. Archeological works revealed many excellently preserved graves and lots of precious artifacts – such as the oldest gambling dices in the world or the oldest glass eye. Unfortunately, not so much remained on the ground – some clay and straw structures, including remainings of the graveyard. I believe all of them are modern reconstructions. After the visit to the site we were guided by one of the locals to the museum nearby. It gives much better explanation of the site. The staff seemed to be honored with our visit – they granted us with books about the site (in four languages) as well as Beluchistan and Sistan province (only in farsi). When driving through Beluchistan and Sistan remember that this province differs from others – it is still problematic and the control of central government is much stricter than in other provinces. I found it problematic to tank the car there – normally you drive and tank, but in Beluchistan and Sistan you have to have a special card for that. Obviously you don't have it, so the only option is to pay another drivers or to buy gasoline directly from the street. It is so cheap in Iran (full tank cost 4 EUR at the end of 2018) that you won't lose too much money. Site visited in May 2017. Sharhr-i Sokhta or Shahr-e Sūkhté (farsi name means exactly Burnt City in English) is located between Zabol and Zahedan (Iranian towns that are located close to Pakistan border, around 177 km from Zahedan and ca 55 from Zabol). In theory there is a convenient public transport from Zahedan (oficial taxi from Zahedan Bus Station to Zabol, a place in a car should cost around 5 Euro per person, one way). It is also possible to hire a taxi on your own for the whole trip (dar baste) - including waiting time - prices are negotiable. The site consists of two parts: main excavations area covering around 150 ha - vast land where only 3 % of the ancient city is uncovered and prepared for visiting. Second part is a small museum located on the opposite side of the road, some 900 meters from the exavations entrance. It is good to start visiting the site from small Visitors Centre (all the information, photos and maps are displayed in Farsi and English). Excavation site is serviced by circular hiking path covering all attractions (building sites, so called temples, craftsmen area, graveyards). Have in mind that currently it is almost a desert, no trees, no shadow so take plenty of water if you want to wander around. The museum is relatively small but at least is under roof. The site itself is not very popular along Zahedan people but taxi drivers know the place. Oldest Buildings: - 3200-1800 BC "Founded around 3200 BC, it was populated during four main periods up to 1800 BC, during which time there developed several distinct areas within the city: those where monuments were built, and separate quarters for housing, burial and manufacture." Role of Women: A number of 5,000-year-old insignias, which were found in the graves of some female inhabitants, suggest that the women of the city enjoyed social and financial prominence.